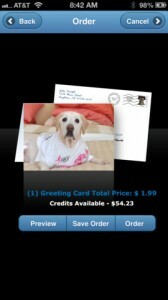 Card2You is an iPhone app developed byAdvanced Image Direct. 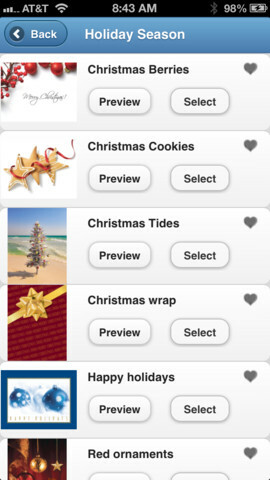 This simple, attractive app allows users to create and send physical greeting cards right from their iPhones. Just because we live in a fully digital age doesn’t mean that people don’t love to get physical, thoughtful letters in the mail. Card2You saves you the hassle of finding an envelope, creating your letter, and standing in line at the Post Office to get a stamp. You get all the credit due to you for sending a real letter, but with none of the annoyances. 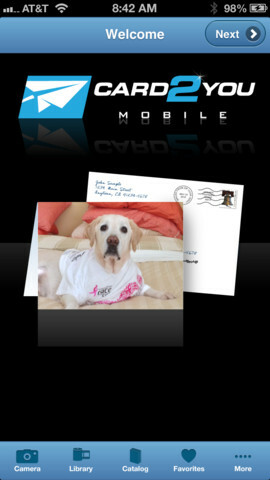 In just a few taps, you’ll have a great piece of mail designed and ready to be sent out. Your final designs are mailed via USPS within a few days, for $1.99 or less. Simply select your favorite photos, pick your recipients, and your art greeting cards get packed into personalized envelopes. Now, the data for your recipients will be pulled from your Contacts list. In other words, make sure that you have updated (and complete) info for your contacts, or you’ll run into a snag. You can always enter the person’s address manually. One thing that’s really neat is the ability to add not just images, but QR codes to your messages. I could see someone using this app to send out party invites, private shopping invites, or simple birthday greetings. The UI is really straightforward, and the overall user experience is really satisfying. Overall, Card2You blends the ease of digital card selection with the personal touch and warmth that only a real, physical letter can deliver. These days, it’s too easy to delete or ignore messages from our friends: it’s much harder to ignore a letter, and this app makes it easy to send tangible greetings. 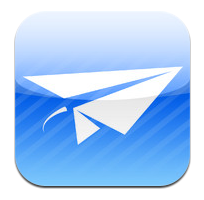 Card2Youis compatible with iPhone 3GS, iPhone 4, iPhone 4S, iPhone 5, iPod touch (3rd generation), iPod touch (4th generation), iPod touch (5th generation) and iPad. Requires iOS 5.0 or later. This app is optimized for iPhone 5.